"When he was younger he was a movie star, mostly in Westerns. At the age of sixty, Howard uses drugs, alcohol and young girls to avoid the painful truth that there are only supporting roles left for him to play. After yet another night of debauchery in his trailer, Howard awakens in disgust to find that he is still alive, but that nobody in the world would have missed him if he had died." "Howard gallops away on his movie horse in full cowboy regalia; fleeing from ... his life." And it is a Road Movie.
" ... 94% of Americans already having used the product and a mind-boggling 80% of U.S. households currently having a can of the stuff in their homes." With limited upside in the garage, WD-40 is expanding its market with a "No-Mess Pen" targeted at "moms" and listing 300 new uses for the pen from "removing crayon marks from walls" to "stopping zippers from catching." 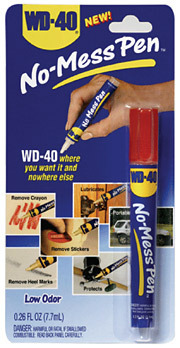 The WD-40 Pen is another product that is "Strong enough for a man but made for a woman."